Figure I-1. Wind turbines in juxtaposition to conventional power plants. Figure 1-1. World Wind Generation. Figure 1-2. North American Wind Capacity. Figure 1-3. European Wind Capacity. Figure 1-4. Major Centers of Wind Generation. Figure 1-6. North American and European Wind Generation. Figure 1-12. Models of Wind Development. Figure 1-13. Small Wind Turbine. Figure 1-14. Stand-Alone Wind Machines. Figure 1-16. Hybrid Power System. Figure 1-17. End of the Line. Figure 1-22. California Wind Capacity. Figure 1-23. European Wind Generation. Figure 2-1. Wind turbine under test at Denmark's Risø National Laboratory. Figure 2-2. Danish Wind Generation. Figure 2-3. 1993 Specific Price. Figure 3-1. Government R&D Expenditures. Figure 3-3. Danish Wind Turbine Exports. Figure 3-5. AWT. R. Lynette Assoc. 's 26-meter (85-foot) Advanced Wind Turbine undergoing tests near Tehachapi, Calif. Figure 4-1. Rotor Diameter and Swept Area. Figure 5-2. English Post Mill. Figure 5-3. Multiblade Farm Windmill. Figure 5-4. Flint & Walling Star Zephyr. Figure 5-7. Technology Pathways for Small Wind Turbines. Figure 5-10. Bergey 1500, An Integrated, Direct-Drive Small Wind Turbine. Figure 5-11. Specific Rotor & Nacelle Mass for Small Wind Turbines. Figure 6-1. Rayleigh Wind Speed Distribution. Figure 6-2. Increase in Wind Speed with Height. Figure 6-3. Increase in Wind Power with Height. Figure 6-4. Typical First-Generation Danish Wind Turbine. Figure 6-7. Sample Power Curves for 500 kW Wind Turbines. Figure 6-9. Power Curve and Annual Energy Output. Figure 6-10. Typical Specific Yields. Figure 6-11. Equivalent Capacity Factor. Figure 6-13. Specific Yield in California and Denmark. Figure 6-14. Horizontal and Vertical Axis Wind Turbines. Figure 6-15. Vertical Axis Wind Turbine Configurations. Figure 6-16. Experimental Three-Bladed Darrieus. Figure 6-18. Technological Pathways for Medium-sized Darrieus Turbines. Figure 6-19. Horizontal Axis Wind Turbine Configurations. Figure 6-20. Typical Second-Generation European Wind Turbine. Figure 6-21. Technological Pathways for HAWTs. Figure 6-22. Specific Rotor & Nacelle Mass. Figure 6-24. Carter Sr. Wind Eagle. Figure 6-28. Integrated Drive Train. Figure 6-29. First Generation Drive-Train. Figure 6-30 U.S. Windpower 56-100. Figure 6-34. Ship or Bulkhead Frame. Figure 6-35. Taper and Twist. Figure 6-38. Rotor Blade Mass. Figure 6-41. Pitchable Blade Tips. Figure 6-42. Variable Pitch Blade Tips. Figure 6-43. Ailerons or Flaps. Figure 6-44. Utility-Compatible Wind Machines. Figure 6-46. U.S. Windpower 33M VS. Figure 6-47. Servicing Enertech E-44 near Palm Springs, Calif. Figure 7-1. Wind Power Plant Price. Figure 7-2. Operation, Maintenance, and Fuel Costs. Figure 7-3. Relative Cost of Wind Energy in California and Denmark. Figure 7-4. Relative Installed Price by Rotor Swept Area. Figure 7-5. Effect of Installed Cost on the Relative Cost of Energy. Figure 7-6. Levelized Cost of Electricity. Figure 8-4. 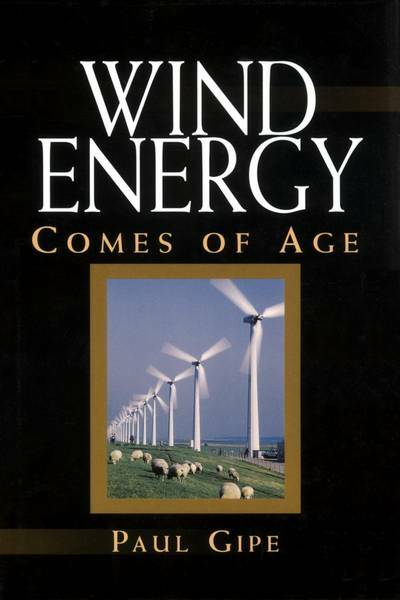 Acceptance of Wind Energy. Figure 8-6. Power Plant Acceptance. Figure 8-8. Power Plant Preference. Figure 8-10. Box on a Stick. Figure 8-11. Aesthetically Pleasing Designs. Figure 8-12. Lattice Tower Shape. Figure 8-13. Wind Turbine sans Nose Cone. Figure 8-14. Visual Influence Zones. Figure 8-19. Non-uniform Tower Height. Figure 8-20. Iconography of North German Plain. Figure 8-22. Visually pleasing hilltop array. Figure 8-23. Scarring from Road Cut. Figure 8-24. Rhyd y Groes, Wales. Figure 8-26. Cooperative Membership Meeting. Figure 10-3. Source Sound Power Level. Figure 10-4. Treating Trailing Edge. Figure 10-5. Bonus Tip Torpedo. Figure 10-6. Projected Noise Level. Figure 10-7. Projected Noise Level from Bonus Combi. Figure 11-4. Lunch Break on Pacific Crest Trail. Figure 11-5. Wind Energy and Cropland. Figure 11-7. British Road Construction. Figure 11-10. Pleasing Ridge-Top Array. Figure 12-1. Tourism at Delabole. Figure 12-2. School Group at Ebeltoft. Figure 12-3. Tourism at Zaanse Schans. Figure 13-1. Solar Energy in California. Figure 14-1. U.S. Wind Energy Potential.